The residence of Mrs. J.E. Smith Hadden designed by Peabody, Wilson & Brown c. 1918 in Jericho. The Hadden's son was married to Julian Peabody's sister. I do not believe the house still stands. Emily Georgina Hamilton, a daughter of J. Augustus Hamilton, married Jess E. Smith Hadden, who was a silk importer. He died in 1914 at the couple's apartment at Stratford House in New York City, while she died at the house posted here on 8 November 1925. 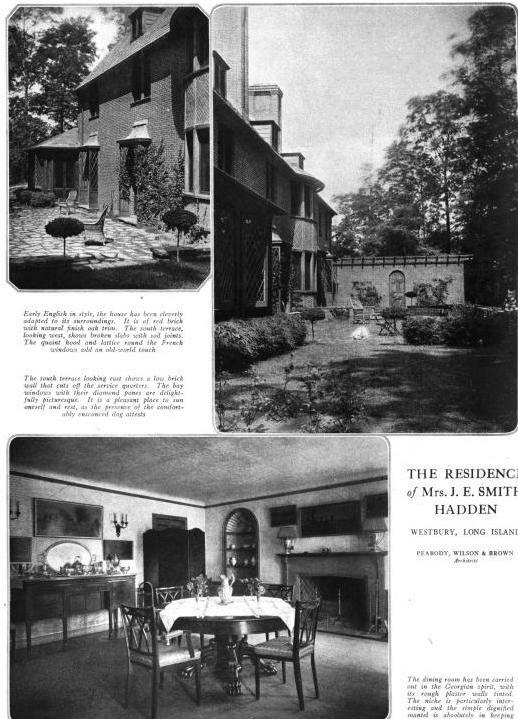 Before this residence was built, the Haddens' country house was Uniondale Farm in Hempstead. Could the house posted here have been called Dogwood? The couple's daughter, Frances, who died unmarried in 1945, died in Westbury at a house called Dogwood. The SPLIA book has nothing on a 'Dogwood' but I will look into it when I get back home tomorrow. Spinzia book states this place was called Dogwood. Well there you go. Thanks.